when they went to McHenry county, that state. When past twenty years of age, William started for himself, following farming. His parents had removed to Rock county, Wisconsin, in 1866, and he had also spent considerable time there, engaged in farming and the cattle business for a number of years. In February, 1864, Mr. Emery enlisted in Company B, One Hundred and Fifty Third Illinois Volunteer Infantry, and served until the close of the war, being mustered out at Memphis, Tennessee, in September, 1865. He saw quite a good deal of service during that time, and after being discharged he returned to Illinois. The following spring the family moved to Rock county, Wisconsin, where William C. Emery was married in February, 1870, to Miss Elvie E. Watson, she being a native of Rock county. Two children were born to them there, and in 1872, the entire family came to Nebraska. Our subject. came on ahead, driving overland, and reaching Boone county in May. His wife and children arrived in September, and they begun the establishment of a home on the frontier. Mr. Emery had homesteaded on section eighteen, township twenty, range six, and this has been his home since that time. He has been successful. in building up a good farm, and has engaged in stock raising quite extensively, owning at the present time one hundred and forty-six acres, all well improved and the entire place is well supplied with every convenience in the way of buildings, etc. Mrs. Emery died on the homestead in November, 1883, survived by her husband and five children, named as follows: Alice M., Lizzie E., May and Ida, all married and settled in different parts of the country, while the youngest son, Frank W. Emery, lives at home. For many years past Mr. Emery has been connected with the school board of district number thirteen. Prominent among the leading old settlers of Antelope county, Nebraska, is the gentleman whose name heads this personal history. Mr. Ball is a man of active public spirit, always lending his aid and influence for the bettering of conditions in his community, and has served in the capacity of school director and other township offices. Mr. Ball resides in section ten, township twenty-six, range seven, where he has a pleasant home, and enjoys the respect and good wishes of all with whom he has to do. Mr. Ball is a native of Lafayette county, Wisconsin, born January 22, 1860. His father, Joseph Ball, was a native of New York state, born in 1825, and our subject's mother, Henrietta H. (Lewis) Ball, was a native of New Jersey. Mr. Ball, with his parents, moved from Wisconsin to Jo Daviess county, Illinois, where they remained thirteen years, coming to Antelope county, Nebraska, in 1880, taking up a homestead in section ten, township twenty-six range seven, where Mr. Ball still resides in the same house that has stood there ever since. In the first days of his residence in the county, like so many others of those brave pioneers who faced the hardships and dangers incident to those days, Mr. Ball experienced his full share of hard times and disappointments. In 1895 he was hailed out in the storm of that year, and in 1894 lost all his crops by the hot winds prevalent in that summer, which made it very hard for a young man just starting in life. On December 25, 1884, Mr. Ball was married to Miss Laura Bishop, whose parents were early settlers in Nebraska. Her father, Horace Bishop, took up a homestead in 1873, three miles north of our subject's home. Mr. and Mrs. Ball live in their pleasant home on the "old homestead" surrounded by a host of warm personal friends, and are enjoying the respect and esteem of all with whom they have to do. Although the home of Will Stevens Delano has for some years been in Lincoln, Nebraska, he still spends about half of his time on the farm in Custer county, and he is one of the best known men throughout the state. He is a native of Oxford township, Oakland county, Michigan, born October 16, 1856, second of the five children of Mortimer and Rosetta (Stevens) Delano, natives of the state of New York, who were early settlers in Michigan and later pioneers in Nebraska. The family is mentioned at some length in connection with the sketch of Fred E. Delano of Custer county, also appearing in this work. Will Delano received a good education, graduating from the Michigan Agricultural College at Lansing, in 1881, and the following year left his native state. He entered the training department of the United States weather bureau, and six months later was assigned to work at Yuma, Arizona, being put in charge of the station there. where his children have had the advantage of attending the public schools and the state university, and his wife and the children have lived there since 1903. The names of the three children are as follows: Crawford M., electrical engineering department, class of 1913; Clarissa, in the Lincoln academy, class of 1912; and Herman S., in the university and under private instructors. Mr. Delano is a life member of the Farmers' National Congress and has served numerous times as the Nebraska delegate to conventions by appointment of the governor. He served as the Nebraska state commissioner to the Atlanta exposition, and is known in many parts of the country for his deep interest in agricultural and kindred subjects. He is secretary of the Nebraska Farmers' Congress, and a member of the Nebraska Rural Life Commission, being in charge of one of the ten sections of the commission - that of taxes - and has named thirty-five associates on the committee. He has long made a special study of economics along these and other lines, and is a fluent speaker, as well as a deep and logical thinker. He is broad minded and liberal in his views, and has hosts of warm friends who extend him their sincere regard and respect. In politics he is republican, and a member of the Modern Brotherhood of America. The first four months on his Nebraska farm, Mr. Delano spent in a "soddy," which was soon replaced with a more commodious dwelling. He began growing alfalfa in 1891, and the scant crop of two cuttings of this was all he raised in 1894, the dry year. It is worthy of note that Mrs. Delano was postmistress of the Lee Park office for a period of fifteen years before the rural routes displaced the small interior offices. The gentleman named in this personal history is well known in Valley county as a successful farmer and business man and worthy citizen. He has made Nebraska his home for many years, and at present, resides on section nine, township twenty, range fourteen, Valley county, where he is numbered among the leading men of his locality. Ored Olsson was born near the town of Hastveda, province of Skane, Sweden, July 3, 1863, a son of Ola and Ingar (Pierson) Olsson, and was fifth in a family of seven children, one brother of whom resides in Oklahoma, and two brothers and two sisters in Sweden; one sister and the parents are deceased, the death of each occurring in Sweden, the father having passed away in 1894, and the mother in 1908. Mr. Olsson received his education in the home schools of his native land, where he grew to his young manhood. In 1883 he emigrated to America, sailing from Malmoe to Grimsby, England, and embarked at Liverpool for New York on a White Star liner. With his brother, Nils, he came to Valley county, Nebraska, where his brother took up homestead land, Mr. Olsson, a couple of years later, pre-empting one hundred and sixty acres of land in section fourteen, township twenty, range fourteen. In 1893, Mr. Olsson returned to Sweden, expecting to remain, but in 1898 again came to America to secure a patent on a windmill, in which he was successful, and in a few months again returned to Sweden. In March, 1899, he again decided to make his home in Nebraska, and on reaching New York was married, on March 17, 1899, to Miss EIna Johansson, whom he met on the vessel "Tentonie" on the way over. She was born in the village of Vinslof, province of Skane, Sweden, and came to America in 1899. Mr. and Mrs. Olsson have had five children, namely: Ingeborg, Clara, Anna, Nils Olof and Ebba. In 1898, Mr. Olsson purchased land in section nine, township twenty, range fourteen, which is now the home place, comprising the whole section, and is a well improved stock farm. He built a fine dwelling in 1899 and a large barn in 1905, which are illustrated on another page of this work. Mr. Olsson is moderator of his school district, number forty-five, and has been serving in that capacity for several years. He is still a young man, prosperous and successful, owning six hundred and forty acres of good land. He is a progressive man of affairs, well known and highly respected. Mr. Olsson was reared in the Lutheran faith; in politics is republican. 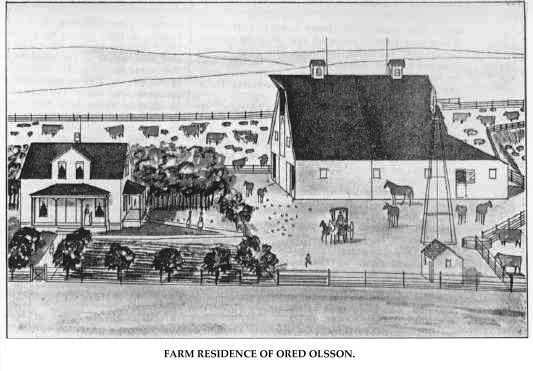 Farm Residence of Ored Olsson. 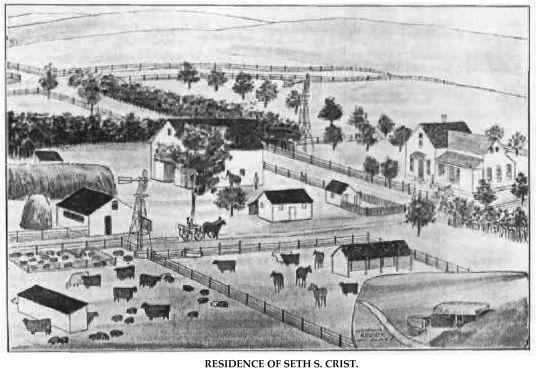 The Crist family were among the very early settlers of Saunders county, Nebraska, and have always stood for the best interest of every community where they have lived. Seth S. Crist was born in Mercer county, Illinois, August 4, 1861, fourth of the six children born to Andrew and Catherine (Wagner) Crist. He has a brother at Thedford, Nebraska, a sister at Ansley and a sister at Ashland, Nebraska, a brother at Kirk, Colorado, and a sister deceased. The father, Andrew Crist, was born in Carroll county, Ohio, of Scotch-Irish parentage, and died in Custer county, Nebraska, January 23, 1907, and the mother, a native of Columbiana county, Ohio, is now living with her son, Seth, although she still owns the home place. Andrew Crist was married in Hancock county, Ohio, in 1849, and in 1869 homesteaded in Saunders county, Nebraska. childhood came to Nebraska with her grandfather, Clark Masterson, who migrated to the west after his wife's death. The parents, John Wesley and Martha Jane (Louder) Masterson, were both natives of Indiana. The young couple began housekeeping on their present home place in Custer county, on sections ten, fourteen and fifteen, township sixteen, range seventeen, where he homesteaded one hundred and sixty acres of land. Their first dwelling was a dugout found on the place in section fifteen, when they first came, and in this they lived until 1890, when their present frame dwelling was erected on section fourteen. We give a view of the home and its surroundings, besides one of the dugout, elsewhere in this work. The place now comprises one hundred and twenty acres in section fourteen, and an adjoining eighty acres in section fifteen. Mr. Crist and wife had ten children, namely: Isaac M., married and living in Custer county, has two children; Ivan B., died in infancy; Susie R., wife of John E. Bray, of Sherman county, has six children; Amy S., wife of Fred Carmody, of Custer county, has three children; Andrew W., married and living in Custer county, has two children; Lovado, wife of Jesse Carmody, of Valley county, has one child; H. Otis, Oscar William, Fern L., and Emory R., at home. Mr. Crist was identified with much of the early history of Nebraska, and is a patriotic and public-spirited citizen, whose integrity and uprightness have won him many friends. He served as director of school district number fourteen for five years, and in all measures affecting the public welfare endeavors to wield his influence on the side of progress and right. He has been untiring in his efforts to bring his farm to a high state of productiveness, being recognized as one of the most progressive farmers of the county. Among the hardships of the early days was the dry year, 1894, when he, more fortunate than most neighbors, raised a little corn in the draws. He mowed his wheat and fed it like hay, thus wintering his stock quite comfortably. The hail of the following year damaged only the corner of their farm. During the blizzard of April 12 to 14, 1873, Mr. Crist and his father started home with some hogs, which the father had purchased. The boy, finding the storm too severe, returned to his uncle's and remained there until the storm abated; he remembers the fierce wind shook the house and gave them no little uneasiness. In the best known blizzard, that of January 12, 1888, Mr. Crist started to a neighborhood sale, and when the storm broke made his way home. The children were kept in the school house until morning, when they were safely brought home, a very hungry lot. Residence of Seth S. Crist. Frank B. Hansen, who since 1889 has made northeastern Nebraska his home, since 1908 has been a merchant at Breslau, Pierce county, and during that time has given his best efforts to the task of assisting in the development of his locality, and incidentally building up for himself a good home and a fine business. He remembers well the early days when pioneers were obliged to suffer all manner of hardships and privations. in getting their homes started, and he richly deserves the prosperity that has come to him through honest industry and faithful labor. Mr. Hansen was born October 20, 1865, in the village of Sud-Georgsfehn, East Friesland, Germany, a son of Hans and Mary (Linemann) Hansen. After reaching manhood, Mr. Hansen followed the sea, as did his father before him. He served his country in the army for one year and seven months prior to emigrating to the new world. In 1889 he came with his parents to America, sailing on a steamship from Hamburg, Germany, and after spending twelve days on the water, landed in New York. Coming west, they settled in Platte county, Nebraska, where they lived on a farm twelve years before moving to Knox county, half way between Wausau and Creighton. The father is now residing one mile from Little Falls, Minnesota. Mr. Hansen was married in Madison, Nebraska, to Miss Katie Witjes, in 1900, they having one child, a daughter named Freda. Mrs. Hansen is a daughter of John and Volste (Evers) Witjes, and was born in Sud-Georgsfehn, East Friesland, Germany. The family came to America in 1882, and settled in Fillmore county, Nebraska, twelve miles from Kearney. The family then lived in Colorado ten years, coming to Platt county shortly before Mrs. Hansen was married. Her parents then lived in Knox county ten years, and removed to Buffalo county in 1910. Mr. Hansen votes the democratic ticket, and he is affiliated with the German Lutheran church. He owns a well stocked country store in Breslau village, and is widely and favorably known. Reverend Peter Grobbel, prominently known in St. Paul, Nebraska, has for the past two years held the position of assistant pastor of the Roman Catholic church of that city. Reverend Grobbel is a young man of fine education and high mental attainments, and by his earnest and faithful attention to duty has won for himself a lasting regard in the hearts of the people of his congregation. Philosophy. During the following year he was again inscribed in the faculty for philosophy at Freiburg, Switzerland. The years 1899 to 1901, inclusive, were spent in Bonn university, where he was inscribed in the faculty of theology. He next went to Rome and took up the study of theology and philosophy, then to the University of Freiburg, where in the fall of 1905 he completed his studies. In the latter year Reverend Grobbel came to America, his first location being at Spaulding, Nebraska, beginning his work as assistant pastor of the Catholic church. After a short time there he was transferred to West Point, Nebraska, remaining but a few months, then returned to Spaulding. From there he was sent to Kearney, but on account of failing health was obliged to give up work temporarily, and took a trip back to his old home in Germany for several months. Upon his return to Nebraska he spent some time in South Omaha, and in July, 1908, received his appointment as assistant pastor in St. Paul, which post he filled to the complete, satisfaction of the entire congregation. On January 10, 1910, by grace of authority, he was made the pastor of the Roman Catholic church at Randolph, in Cedar county, removing to that city. Reverend Grobbel is a broadminded and liberal man, aiding in every way possible those who come to him for advice and help, and his success in his labors is due in a great measure to his zeal and conscientious devotion to duty. In addition to this he is thoroughly equipped with a splendid education in every branch of study, having at his command six different languages in which he is equally proficient. Edgar A. Easterbrook, a pioneer of Valley county, is a large land owner and still has the original homestead he secured over thirty years ago. He and his family passed through the trials and hardships of early times in the vicinity and triumphed over adverse circumstances and conditions by untiring energy and perseverance. Mr. Easterbrook was born near Susquihanna, Susquihanna county, Pennsylvania, January 11, 1850, ninth of thirteen children in the family of William and Cynthia (Barrett) Easterbrook, parents of nine sons and four daughters. Both parents were natives of the state of Vermont. Four of their sons and two daughters now survive, but Edgar is the only one living in Nebraska. Both parents are deceased. In youth Edgar A. Easterbrook followed farming and attended the public school. At the age of twenty-one years he started in life for himself and in February, 1873, removed to Iroquois county, Illinois, where he began operating a leased farm near Watseka, the county seat. He returned to Pennsylvania early in 1876, and on February 18, of that year, married Clara, eldest of the five children of Edgar M. and Emeline (Follett) Foster. They were married at the Foster home, and began housekeeping on the farm in Illinois. Her parents followed to the west a few years after Mr. Easterbrook came, and were early settlers of Nebraska. Three of her brothers live in the west: Fred, in Loup City; Frank, in North Dakota, and Ira, in Idaho, while the sister, Cora, now Mrs. Adison Brush, lives in Cleveland, Ohio. In February, 1880, Mr. Easterbrook, with his wife and their one child, came to Nebraska, and soon afterward, after making a short stay at Kearney, came to Valley county, where they had relatives. He had chartered a car to Kearney, upon leaving Iowa, and had brought his household goods, teams and some other stock, but not finding a farm to suit him in that vicinity came on to Valley county and took up a homestead. He came with teams and wagon from Kearney, bringing such of his goods as he was able the first trip, and Mrs. Easterbrook well remembers this journey of seventy miles when she rode on top of a large box, with her babe in her arms. Mr. Easterbrook made an entry of the homestead on the southwest quarter of section twenty-three, township eighteen, range sixteen, and erected a small sod shanty, hauling the lumber for roof, doors and casings from Grand Island. Here he began pioneer life, taking an active interest in public affairs. He helped organize school district number nineteen, the meeting for this purpose being held in the Easterbrook sod shanty, the first school house being built of sod. Mr. Easterbrook and wife later occupied a good frame dwelling, and lived on this homestead farm until March, 1910, when they moved to a farm of one hundred and thirty-five acres adjoining the corporate limits of Arcadia on the east, where they have a comfortable home, well improved and equipped for handling and feeding stock. He has purchased this farm, but still owns the homestead. Five children were born to Mr. Easterbrook and wife, all of whom survive: Edith, wife of Christian Bossen, of Valley county; has three children; Cora, wife of George Parker, of Valley county, has one child; Ida, the wife of Charles Smith, now studying for the ministry at Boston, Massachusetts, though their home is in Nebraska, has one child; Arthur and Ernest, unmarried. and living at home. The family have a wide circle of friends and are well known in social circles. Mr. Easterbrook is a believer in the principles of the populist party. He is a member of the Methodist Episcopal church and the Tribe of Ben Hur. severe hail storms. One of the most unusual phenomena he ever witnessed was a rainbow at nine o'clock at night, the full moon serving in place of the sun as a luminant. To the men of perseverance and stalwart determination who went to Nebraska when it was yet undeveloped as an agricultural and commercial region, the present prosperity enjoyed there is due, and foremost among these is the gentleman whose name heads this review. Mr. Patzel being among Madison county's earliest settlers and being intimately identified with its progress, gaining incidentally an enviable reputation as a good citizen and honorable man. August Patzel was born in Pommerania, Prussia, August 13, 1849. He grew up in that country, following farming as an occupation until he was twenty-four years of age, at which time he decided to try his fortune in the new world. Taking passage on the steamship "Fritzmus," he crossed the sea as an emigrant, arriving in America safe and sound, after an eventful trip, his landing place being New York City. He first went to Cleveland, Ohio, remaining in that place but a short time. In 1877 he migrated to Columbus, Wisconsin, working at farming for three years, then, with a team of horses which he had purchased, he started to drive through the country to Nebraska. He landed in Madison county in the month of May, and after looking around for a short while, selected an eighty-acre tract of railroad land, which he purchased from the company. On this he built a sod house, and in order to earn some money to get a start on his farm, worked out on different ranches in the region to make a living. He found that it was very hard to save anything, so started on foot for Iowa, where he located in Buena Vista county and started to work on a farm by the month, sending home each month to his family in Nebraska a little money to enable them to keep comfortable. In spite of this, they found it a problem to meet their needs, and often suffered extreme hardships, at one time being compelled to live on corn meal alone for two weeks. They tried hard to keep the farm going, and while they raised some grain and vegetables, suffered the loss of crops at different times, in 1894 all their crops being destroyed by the drouth. This discouraged Mr. Patzel to such all extent that he sold his farm and removed to the homestead which he now occupies and which is located on section twenty-eight, township twenty-two, range four. This he has developed into a fine estate, having it fitted up with substantial buildings, well fenced and raises splendid crops of grain, etc., also deals quite extensively in stock, and is classed among the. successful farmers of his section. Mr. Patzel was united in marriage January 24, 1875, to Miss Regina Ebert, who is a native of Pommerania, Prussia. To them have been born seven children, named as follows: Minnie, Fred, Herman, Anna, August, junior, Retta and Lizzie. Mr. Patzel and his family are well liked by all in their community, and take all active part in neighborhood affairs. Politically our subject is a republican, and also a member of the German Lutheran church and the Ben Hur lodge. Alfred Pierce is an old settler of Custer county, being one of the prosperous and progressive farmers who continue to live on their original homesteads. He is enterprising and energetic, along the lines of his work and although one of the younger homesteaders of the county, he is old in experience of pioneer life. He was born in Leroy, Mower county, Minnesota, May 1, 1862, fourth in order of birth of the eight children of James and Jane (Hunt) Pierce. He was reared and educated in Minnesota and in 1882 joined his father in Custer county, taking a homestead for himself in May, 1883, on the northeast quarter of section six, township eighteen, range eighteen, which has remained the home place until the present time. He has improved and developed the land until he now has it in a high state of productiveness. He is the owner of two hundred and forty acres of land and has a good standing in the community. For several years he was a member of the local school board and he takes an active interest in public affairs of the county and state. On September 16, 1898, Mr. Pierce was united in marriage with Minnie L. Knight, daughter of John O. and Lovenia (Straight) Knight, a native of North Brookfield, Massachusetts, who came to Custer county in 1883. No children have been born of this union. Both Mr. Pierce and wife are well known in their part of the county and are prominent in various movements for the general welfare. It would be impossible to touch upon the history of northeastern Nebraska, no matter how lightly, without mentioning the above gentleman who is one of the most prominent of the old settlers. For more than forty years, Mr. Richardson has lived in this section of the country, and has seen it develop from a wilderness to its present plane. He has labored long and faithfully, and is now enjoying a well earned rest. he grew up and received his education in the common schools of that state. In 1870, Mr. Richardson came with his young bride to Wayne county, Nebraska, and took up a homestead in section thirty-one, township twenty-six, range four, where he now resides. They met with many discouragements at first, as grasshoppers took the crops for two seasons, 1873 and 1874. Prairie fires were frequent during the hot, dry summer months, and were a constant menace to the settlers at that season. The nearest market for many years was Sioux City. Firewood had to be hauled for fifty miles or more, and many times they were compelled to burn corn and weeds to keep warm, when the supply of wood was exhausted. However, brighter times came at last, and Mr. Richardson was enabled to add such improvements to his farm from time to time, as to greatly enhance its value. It is at present one of the finest estates in the county. Mr. Richardson is well known to all public men of this section of the state, and has always done his full share in assisting in public duties. The esteem in which he is held may be guessed when it is said that he was county commissioner for nine years, and for two years held the important position of county treasurer. In politics he is a republican. In 1870, Mr. Richardson was united in marriage to Miss Arlina Sherman. Four children were born to them: C. F., Claude, H. V., and Maude. Mrs. Richardson died in 1882. In 1886, Mr. Richardson married Lucretia L. Rogers of Wisconsin. Among the leading and substantial agriculturists of Merrick county, Nebraska, the gentleman whose name heads this review occupies a prominent place. Mr. Wymer lives on section nineteen, township fifteen, range seven, where he has one of the valuable estates in that locality, well improved, and enjoys a peaceful and happy home. Frank E. Wymer, farmer, son of Robert and Sarah (Westbrook) Wymer, was born in Bureau county, Illinois, July 24, 1871, and was sixth in a family of six children, all of whom reside in Illinois, where the mother still lives, but the father died in the old home in 1905. Our subject received his education in-the schools of his home state, and later learned carpentry, following his trade for nine years. On July 27, 1893, Mr. Wymer was married to Miss Eva Adams, of a Nebraska pioneer family, in Spring Valley, Illinois. Mr. and Mrs. Wymer have one son, Wayne, who resides at home. Mr. Wymer has been director of his school district, number thirty-four, since 1907. He came to Nebraska in 1903, and purchased two hundred and forty acres of fine, farm land in section nineteen, township fifteen, range seven, building a fine modern home, splendid barns, and other buildings, it being a fine stock and grain farm. Although not one of the very oldest settlers of this portion of Nebraska, Mr. Wymer has become closely identified with its later history, and is a man of sterling character and active public spirit. Since his advent to Nebraska, Mr. Wymer has contributed in no small degree to the welfare of his community, and assisted in the development of the farming resources of the locality in which he chose his home. William Balleweg, a retired shoe merchant of Creighton, first set foot in the town in August, 1884. At that time he did not work at his trade, following farming near the town for several years, during which time he filed on a homestead situated thirteen miles south of Stuart, in Holt county. He lived on the place the required length of time to secure title, working out on neighboring farms when he had leisure from his own work, often walking long distances in order to earn some extra money. On one occasion, he drove through the country over forty miles of rough road, and, night coming on, he asked for accommodations for himself and horse. The people were willing to keep him, but had no place for his horse, so he plodded on, and on coming to the next farm was told that they had no room for him, but could keep his horse. He decided to push onward, and finally came to a big ranch owned by a big Irishman, who informed him that it would be impossible to put him up for the night as he had seven children, and with his wife and himself, made nine in their small house. Mr. Balleweg was thoroughly tired out, and discouraged, so said "Well, I make ten, for I am going to stay," which he did. During the conversation in the evening it developed that the host hailed from Litchfield, Illinois, Mr. Balleweg's former home, and had many times passed the latter's shop, and after a short time spent in talking over times, etc., he retired to his bed on the floor, which, however, he found better than lying along the roadside. His first dwelling was a sod house built by himself with a sod roof, which would become water-soaked in a heavy rain, and the water would leak through and often on to the bed, when Mr. Balleweg would crawl under the bed, and thus enjoy a short respite from the disagreeable wetting. After a time, the water would drip through the bed and cut short his comfort, but in spite of these little incidents everybody seemed to be happy and look forward to the time when they would have a comfortable home and escape from these difficulties. up as a garden, and raises small vegetables, fruits, etc., and from his experience on the farm is making of this a profitable venture. William Balleweg was born in the village of Reppberg, Kingdom of Baden, Germany, on February 25, 1846, making that his home for fourteen years, then started out in the world alone, taking passage on a sailing vessel at Bremen for America. After fifty-eight days on the sea he landed in New York, going to the home of an uncle at Oxford, with whom he lived for some years. His uncle was a prosperous shoe merchant, and our subject was with him during the famous battle of Gettysburg, watching the battle from the roof of a house in Oxford. He would go out at night from home to mingle with the soldiers, and his aunt learning of this, threatened to lock him up if he did not promise to remain at home. After the engagement he used to go all over the field, asking information, and learned many incidents connected with the action in this way. He remained in Oxford until January, 1864. then migrated to Seymour, Indiana, where he spent one year, and from there located in Illinois, following various lines of employment. He worked at different times in Henry, Litchfield and Edwardsville, at the last mentioned place being in business with his brother Edward. For some time prior to coming to Nebraska, he had been in the shoe business at Henry. The Balleweg family for a number of generations had been engaged in the manufacture of boots and shoes in the old country. During the first days of their residence in Nebraska, Mr. Balleweg was often away from home days at a time, when his young wife would be left alone in their cabin, with the prairie wolves howling around the door. They were particularly fond of poultry, and often Mrs. Balleweg was obliged to use every means to drive them away in order to save her poultry. Mr. Balleweg was married in Antelope county, on May 30, 1888, taking as his wife Kate Rehberg, who was a native of Wisconsin, and settled in Nebraska with her parents in the spring of 1885. Mr. and Mrs. Balleweg have four children, Carl, now living with an uncle on the latter's farm in Antelope county; Hyacinth, Esther and Otto, all still under the parental roof. The Balleweg family are regular communicants in the Catholic church and Mr. Balleweg is a member of the Knights of Columbus. In compiling a list of the representative farmers of Stanton county, Nebraska, a prominent place is accorded the name of the above gentleman. For many years past, Mr. McInerney has been engaged in agricultural pursuits, and as one of the old settlers, has done his full share toward the development of the better interests of the community. He is the owner of a well improved farm in section twenty-four, township twenty-two, and still holds his interests in Stanton county, although he now resides at Wayne, in Wayne county. Mr. McInerney was born in 1862, in Niles, Ohio, and is the son of John and Bridget Mclnerney, both from County Clair, Ireland. His parents came over to America in the early days, when it took their sailing vessel sixteen weeks to make the trip. The subscriber remained at home with his parents, who moved in 1866, from Ohio to St. Joseph, where they took a boat up the river to Council Bluffs, Iowa. They remained here until 1877, and it was here that the subscriber secured most of his education. In 1877, the family removed to Douglas county, Nebraska, where they remained for some years. In 1888, our subscriber came to Stanton county and invested in railroad land. Time has proven the wisdom of this course, as he owns some of the most valuable land in the township. In 1889, Mr. McInerney was married to Miss Anna Coleman. They are the parents of five children, all of whom are still living: Agnes, John, Gertrude, Winifred and Everett. The family is prominent socially in the community, and they enjoy the respect and esteem of everyone who know them. George W. Wiltshire is an old settler and successful agriculturalist of Antelope county, Nebraska, having come here in 1879. He has had an eventful and varied history, and has not come to his present comfort and ease without passing many trials and much privation. He has resided in this county for the past thirty-two years, and still lives on the old original homestead farm, which is now well improved. Mr. Wiltshire has built two sod houses in his day, as coming to this region at so early a date it was some few years before lumber could be procured with which to build a dwelling. Mr. Wiltshire was born in Ross county, Ohio, October 25, 1846. His father, Evender Wiltshire, was born February 19, 1821, in Virginia, and after growing to manhood moved to the state of Ohio. In the year 1880, our subject's father, Mr. Wiltshire, experienced a bad accident, a tree falling on him, from which injuries he died. Our subject's mother, Matilda (Hartman) Wiltshire, was born in 1821 in the state of Maryland.